Type of Camp: Developed Campground Fee: $10 single site, $16 double site + $4 for available electric. Golden access and other inter-agency passes are accepted. Cell Signal: sufficient signal without amplfication for air card to function on Verizon. Weak to intermittent voice signal without amplification. How I found This Camp: I was referred to this location by a USFS Employee at the Ranger Station in Mackay.... the poor map we were using that day only showed the reservoir and no campgrounds. 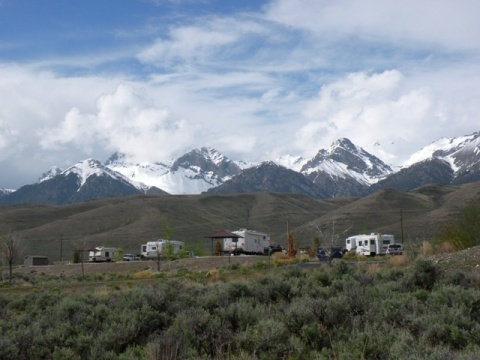 Mackay, Idaho is just about the most RV and visitor friendly place we've travelled through. There are several locations for dispersed camping in the area. Both North and south of Joe T. Fallini campground are multiple free locations.With very visible signage on the highway. Generally referred to in the area as "Sportsman Access"South of the Dam is "Big Lost River" and "Mackay Dam" areas. There were also two, much more open areas, just to the north of Joe T. Fallini campground. Those areas on the south side are fairly tight... so I'd advise "scoping" them out before you pull in. Back in the Town of Mackay;At the end of Capitol Street on the West side of Mackay is a small grassy, shady park provided by the city with FREE parking with a 3 Day limit.There is a Camp Host on Duty that can fill you in on any particulars. Also, for just an OVERNIGHT parking spot, a block East of Hwy 93, on Custer is a graveled lot provided by the city with a 16 hour parking limit.The City has also provided a Dump Station at that location. If your confidence is lacking to find your own genuine, full, RV Boondocking campsite, Do this. Stay in one of the developed campgrounds. You're still boondocking. From there, make daytrips checking on Campsites using This campsite search method. When your confidence has grown sufficient, you can start going straight there rather than the short stay in a paid, developed camp.